Pancreatic pseudocyst rupture can lead to a dangerous complication called necrotizing pancreatitis when a portion of the pancreatic tissues or ducts die and start producing necrotic by-products that can quickly fill bloodstream with toxins. Pancreatic pseudocyst treatment is preceded with a CAT scan diagnostic test that will describe the state and size of the cyst to determine if further treatment is necessary. Not all types of pancreatic pseudocysts require treatment, if a pancreatic pseudocyst is less than 6 cm in diameter and does not present any symptoms, it usually is left untreated and regularly monitored for changes in its size and location. 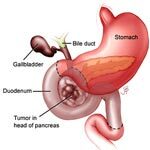 Pancreatic pseudocyst treatment is very complicated and often requires multiple specialists present during a surgical drainage like radiologists, gastroenterologists and pancreatic surgeons. Pancreatic pseudocyst drainage is performed by means of creating a connection between a cyst and the closest part of the stomach that will allow the cyst liquids to empty into the intestinal cavity. Alternative pancreatic pseudocyst treatment is performed by a radiologist draining the cyst with a needle; however this technique presents a lot of infection complications. Endoscopic approach to pancreatic pseudocyst treatment involves a surgeon using endoscopic tools to insert a small tube inside a cyst and connect it with the intestines to relieve the cyst fluids. In order to avoid potentially dangerous pancreatic pseudocyst, prevention of pancreatitis symptoms is of utmost importance. Diet for chronic pancreatitis helps manage body’s impaired ability to process high amounts of fat and simple starches. Diet for chronic pancreatitis includes a lot of fresh fruits and vegetables, healthy fats and whole grains to ensure proper function of your pancreas.